Sending students and state employees to the cotton fields, 2010. Source: Ahrca.orgUzbekistan’s sharp swing towards democratic values in the post-Karimov era is unprecedented. After the death of Uzbekistan’s president Islam Karimov, who had ruled the country since 1989, the prison system’s doors have been flung open. International human rights organisations and monitoring missions are now visiting the country. The openness and diplomatic vigour of new president Shavkat Mirziyoyev’s administration has led to many people to believe that the changes are genuine and long term. But the discussion of what is behind the Uzbek “perestroika” and how to react to it has divided opponents of the regime. The change has been dramatic, but certainly not complete: people who have suffered for their beliefs have not been rehabilitated, and their torturers remain unpunished; people who were exiled and forced to leave the country have received no guarantee of their safety should they return; there are still no independent media; and the use of forced labour and the persecution of bloggers continues. Before we start declaring a “new Uzbekistan” and calling for an end to the boycott of Uzbek goods, we need to take a critical look at how deep the reforms go in a country where civil society has been viciously repressed and fundamental rights and freedoms, including freedom of speech, assembly and trade unions, banned. About a year has passed since that autumn night when a sudden order was given to return all students to the classroom from the cotton fields. The confused and drowsy students (and their equally confused tutors) were roused from their mattresses and pushed into emergency transport to be returned to their homes. The order was given at night because it came from another hemisphere – from Washington, where it was still daylight and President Shavkat Mirziyoyev was in negotiations with the World Bank. The stakes were high: the World Bank doesn’t offer a billion dollars to just any old country. The offer came, of course, with strict conditions attached, including massive reform, starting with a ban on slave labour in the cotton fields. That night was a turning point. It gives us an idea of the motives behind, and essence of, Uzbekistan’s reforms. The previous administration, led by Soviet partocrat Islam Karimov, was founded on feudal fear and basically reproduced the Soviet model of government of the late 1940s, with the portraits of Stalin just replaced with those of the first president of independent Uzbekistan. But Mirziyoyev has no desire to govern a mega-barracks, an outcast state whose very name on a clothes label makes customers all over the world shun its produce. He would rather rule on the basis of market principles, where power is based on the capital it controls. The extent of this control has not yet been established, but what is essential at this point is a transformation of this command-penal-economy into an economy open to investment and technology. Uzbekistan is once more open for direct investment, accompanied by multinational companies and their managers. These managers will not be the romantically-minded pioneers who swamped the post-soviet world in the early 1990s. International business has changed a lot since then, accumulating the most unsavoury of practices and breeding a new generation of managers – in Russia and its neighbouring countries – who are interested only in numerical indicators. They are the people who will lead the way to creating a new economy and strict labour relations system in Uzbekistan. They will be supported by the existing state infrastructure, including the state trade unions. And this is all bad news, because there will be no one to challenge this process: there are no real, independent trade unions in Uzbekistan. The last time an attempt was made to create one was five years ago. Fakhridden Tillayev (on the left). Source: Uzxalqharakati.comOn 22 September 2013, Fakhriddin Tillayev and Nuriddin Dzhumaniyazov were picked up by the police at one of the impromptu “labour exchanges” in Tashkent’s Kuilyuk housing estate. They had caught the attention of the cops when they were giving some help to casual labourers, explaining their rights and handing out application forms for them to join an independent trade union. After their arrest, Tillayev and Dzhumaniyazov told human rights campaigners that they had been badly tortured during the police investigation. In March 2014, they were each sentenced to eight years and three months in prison on trumped-up charges. There were no more free people left to create independent trade unions. And in June 2017, the administration of the penal colony where the two men had been imprisoned informed Dzhumaniyazov’s family that he had died on 31 December 2016 (six months earlier! ), supposedly of TB. Like the All Union Central Soviet of Trade Unions in the Soviet period, the only trade union structure in Uzbekistan is the Federation of Trade Unions of Uzbekistan (FPU). This body is part of the country's social security system. It spends its time providing workers with healthcare and running 17 sanitorium and health resorts. The FPU also exercises ideological control over workers’ wellbeing and has propaganda functions designed to assist the public in expressing its support for the regime. And the FPU has a particularly important role in organising transport for public sector workers to take part in forced labour – harvesting cotton and keeping city streets clean and tidy. Indeed, for many years, FPU functionaries, and in particular its leader Tanzila Marbayeva (who is now First Deputy Prime Minister), spoke at international forums and symposiums in the name of Uzbek workers, denying the mass use of forced child labour in the cotton fields. The FPU’s higher echelons are dominated by state officials and the directors of large companies. The federation’s chair himself was appointed to his post on 20 December 2016 at an extraordinary plenary session of its ruling council chaired by the Deputy Prime Minister. The PM himself attended the plenary session, as did the president’s state councillor, and Kudratilla Rafikov, until then the director-general of the Djizaksk Accumulator Plant and a leading member of an entrepreneurs association’, was appointed as new head of the FPU. After talking to FPU members at various levels in February-March 2018, the International Federation of Trade Unions’ Mission came to the clear conclusion that the FPU could not be considered an independent organisation. The shift of Uzbekistan’s economy to market-led practices will inevitably mean mass redundancies, an “optimisation” of the social security system and a rise in prices for transport and utilities. Tensions will also inevitably rise, and the appointment of Rafikov as head of the FPU is a clear signal that, in a period of economic transition, the federation will continue to carry out policing functions at workplaces and its main job will be to nip any autonomous workers’ organisation in the bud, suppressing any protest initiatives. It’s the same in Kazakhstan, where state trade unions ideologically “covered up” for the shooting of striking oil workers at Zhanaozen in 2011, initiating the elimination of independent workers’ organisations and hardening of labour laws in the interests of foreign investors. However, if global public pressure remains firm, Uzbekistan’s new direction will still require liberalisation of legislation and law enforcement practice. In 2016, under pressure from an international campaign to root out child and forced labour in the country’s cotton production, Uzbekistan ratified the International Labour Organisation’s (ILO) convention on freedom of association and the right to unite in trade unions. This convention allows workers to create their own organisations, independent of governments and employers, for the collective protection of their labour rights. Fakhridden Tillayev was given an early release from prison in the spring of 2018, thanks to a visit by a delegation from the international cotton coalition’s Cotton Campaign to Tashkent, and it took place on the eve of a visit by President Shavkat Mirziyoyev to the US for another round of talks in the USA. The human rights campaigners are now calling for Tillayev’s complete rehabilitation and posthumous rehabilitation for Djumaniyazov. 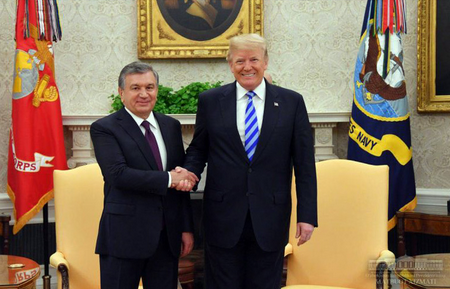 Shavkat Mirziyoyev and Donald Trump at a meeting in the USA. Source: Press service of the President of Uzbekistan.Despite the serious blow dealt to Uzbek civil society under Karimov’s harsh dictatorship, the country’s civic networks were not completely eliminated. A dissident movement and human rights campaigners continued to fight injustice and, in the absence of freedom for trade union activity, took the monitoring of working practices on themselves and worked for the protection of the individual labour rights of individual workers. Many Uzbeks also still remember the collective action taken by schoolteachers in the Fergana and Samarkand provinces in the 2000s; the meeting where over 500 workers in the Akdaryinsk district in Samarkand demanded their back pay; the 12-day rally of workers at the Mashyal cooperative farm (a former collective farm) in Markhamat, Andijan, to demand higher purchase prices for cotton, as well as the strikes by workers at the cotton processing works in Zarbdorsk, Jizzakh province, Tashkent’s Chkalov aviation works and the Angren rubber factory; the rally by thousands of workers at the Fergana oil and chemical processing works. 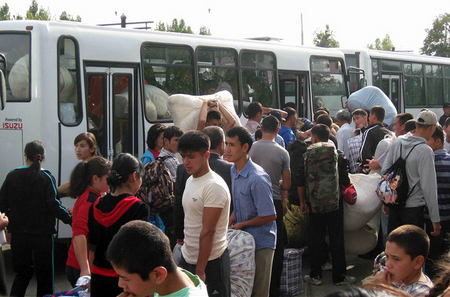 All these actions show a high degree of mobilising ability on the part of Uzbek workers. They were, however, spontaneous and had only a short term economic effect. In general, the repressive system of labour relations had at its core a lack of workers’ rights and the power of the employers — such as the Uzbek government, which showed no scruples in sending children, students, teachers and doctors in their millions to forced labour like serfs. Uzbekistan’s workers now have a new chance to create trade unions and collectively make changes, not only in their working conditions but in a reassessment of the entire system of labour relations. If workers can unite, they can ensure that no one has the power to send millions of people from the cities to the cotton fields and back on a whim, or imprison those who dare to demand better wages and working conditions and assert their human dignity. What will come next? For the Uzbek working class, it depends on their readiness and ability to fight for their rights.